Ashlar finds herself in the belly of the beast. She's got to go through Achilles to try and rescue Nicholas from the clutches of the leader of The Order of Romulus. Will the end of this story arc be the end of Ashlar? After an unexpected break between issues, Bryan Hill and Nelson Blake II are back with the conclusion of the series first arc. Ashlar's thirst for revenge hasn't lessened, she's still determined as ever to kill the people responsible for her mother's death. Hill has kept her consistent, single-minded in her approach with a few annoyances along the way. Yet, she feels responsible for saving Nicholas from The Order as well. Her journey comes to this final showdown and it doesn't disappoint. Without giving away the exciting conclusion, Hill delivers a tense confrontation that flirts with it going a different direction altogether. The dialogue is crisp and direct, making it clear where Ashlar and Reagan stand. The subsequent fight is brutal and beautifully choreographed as it has been throughout the series so far. Blake lays out a well-paced escalation that feels itself building and building until the climatic final act. Blake with Kevin Lennertz produces such a clean and energetic comic through expressive body language, sharp pencil work, and muted colors. You won't see a more dynamic use of composition and spacing in comics. 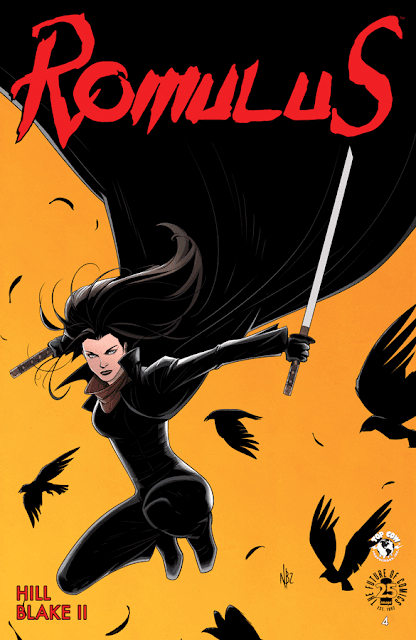 'Romulus' ends the first arc with a bang but leaves us wanting more. The unfortunate delay broke the title's momentum but we're reminded how great it can be when Hill and Blake are at their best. This is still a recommended buy and hoping the next arc will be uninterrupted.